Every year thousands of Americans are killed and others suffer catastrophic injuries as a result of weak vehicle roofs, roof pillars, roof headers and supports that collapse during rollovers. In many of these roof crush/roof collapse cases, the roof supports, collapse allowing the roof to intrude into the occupant safe space. Typically persons injured by roof crush have lower-cervical neck fractures (C4, C5 or C6). In these types of injuries, one must first determine what part of the vehicle caused the injury. If the person remains in their original seated position, then one must determine the point of contact from the intruding roof onto the head. Many times upon careful inspection such evidence or "tail print" can be found. Roof crush injuries are caused by the energy of the vehicle in a roll creating compressive forces pushing down on the top of skull when the head is in an upright position. The compression causes a bursting fracture in the C5 to C7 of the cervical spine. This bursting fracture causes a loss of intravertebral space both anterior and posterior. 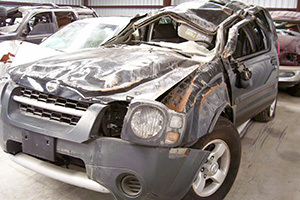 In other rollovers, the roof intruding is not the cause of injury, but it is when the occupant "drives" into the roof, resulting in the head flexing forward before receiving an impact to the top of the head. This causes the bone in cervical vertebrae to fracture, NOT BURST. The posterior corner of the vertebrae then impinges directly against the spinal cord resulting in loss of anterior vertebrae body height. In most SUV rollover accidents involving large SUV's and pickup trucks, severe roof crush is seen. The larger SUVs including the Ford Expedition, Chevrolet Suburban, Tahoe, Yukon, Ford Excursion and Lincoln Navigator and especially larger sized pick-up trucks such as the Ford F150, F250 and F350 Pickup cannot withstand a rollover without serious roof failure. According to Federal Motor Vehicle Safety Standard (FMVSS) 216, a roof pillar on a passenger car must deform no more than five (5) inches when subjected to a force of 1 1/2 times the vehicle's weight, or 5,000 lbs. whichever is less. Pickup trucks (light trucks) are not even required to meet the minimal requirement of FMVSS 216. For example, the roof pillars of a 6,000 lb. pickup truck would need to withstand only 5/6 of the vehicles own weight in order to pass FMV's 216, even though the trucks roof often crushes under its own weight. This "standard" only applies to the front roof supports/pillars not the center or rears ones. To the untrained observer, the roof pillars of an average large SUV or truck appear solid and sturdy, especially strong enough to withstand a roof crush in a rollover. The surprises come through when one looks at a cross-section of the pillar. Most are nothing more than folded/molded corrugated sheet metal, being hollow inside. Therefore, when impact occurs, the metal folds over into the empty inner space allowing more folding or crushing to continue. Studies show that if the inner part of the pillars are either filled with a high density foam or honey combed structure, then roof crush is at a minimal, thus saving lives.